End tab file pockets are great for managing bulky records. 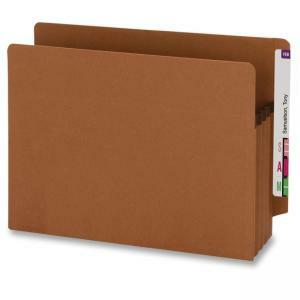 Extra-wide sturdy file pockets expand up to 3-1/2". Rollover Tyvek reinforcement at the top of the gussets make the sides virtually tearproof. Open top and drop front provide easy access. File pocket is made of 100 percent recycled material with 30 percent post-consumer material.